Your Polaris Sportsman is a very capable off-road vehicle. Its lightweight, four-wheel drive system and aggressive tires make it almost unstoppable. For those few times you bury it in the mud in the woods, a winch is worth its weight in gold. A winch works by using an electric motor to pull in a wire cable with significant force. By connecting the end of this wire to a stable object you can pull your ATV to freedom. Remove the Polaris's seat and disconnect the battery using a 10 mm wench. Disconnect the power to the front lights by removing the plug behind them. Remove the access cover to the bumper by snapping out the tabs and lifting up. Loosen the four bolts securing the front bumper and remove the bumper. Loosen the three screws securing the headlight pod. Remove the access cover to the front storage compartment and the front bulkhead access cover (just below the headlight pod). Remove the access panel in the front storage compartment. Fasten the winch to the mounting plate and the fairlead using the supplied bolts and lock washers. Run the winch's wire through the fairlead and fasten the roller to the fairlead using the supplied bolts. Fasten the hook on the end of the wire and tighten them with a wrench. Install the contactor in the rear storage compartment by drilling four holes using the contactor as a template and securing it with the supplied nuts, lock washers and bolts. Drill a half-inch hole in the rear of the storage compartment to allow for cables to be run to the contactor. Route the yellow and blue wires from the contactor out the half-inch hole and along the frame to the location where the winch will be mounted. Run the red and black wires from the contactor to the ATV's battery. Do not connect them at this time. Attach the winch to the front of the frame of the Sportsman using four 5/16-inch bolts. The ATV will have a specific mount on the front. The bolt holes on the winch's mounting plate will align perfectly with these holes. Fasten the yellow and blue wires to the winch. The winch will have color-coded terminals to attach the wires. Simply back off the nut on the terminal, slide the matching color wire underneath and tighten. Attach the bumper back onto the front of the ATV using the reverse of the process you used to remove it. Run the switch wire down to the frame and toward the contactor. 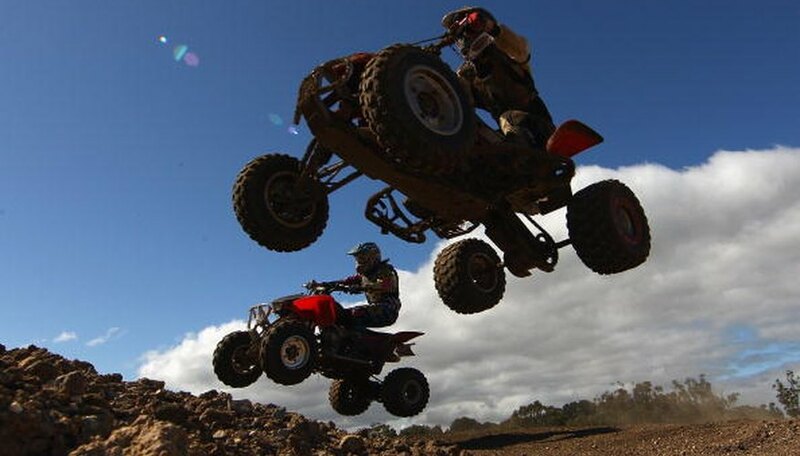 Be careful not to interfere with the ATV's steering or controls. Attach the switch's wires to the color-coded connections on the contactor. Connect the red and black wires to the battery's terminals, making sure to pay attention to the battery's polarity. Connect the red wire from the switch to the accessory wire located behind the light pod with a scotch-lock connector. These connectors work by placing one wire in each groove of the connector and closing the gate. This forces a metal blade into both wires, creating the connection. Secure all lose wires with cable ties. Practice proper winching technique before heading out on the trail.